Basket weaving has an undeserved reputation as a cop-out activity. But the truth is, the craft is so hard it’s often devilishly frustrating — even for Kristine Myrick Andrews, 54, who has been weaving baskets for more than 25 years. “Some days, some things are just maddening,” Andrews declares; for instance, securing the two half-round strips of rattan that make a basket’s rim using only a “wedge” technique. 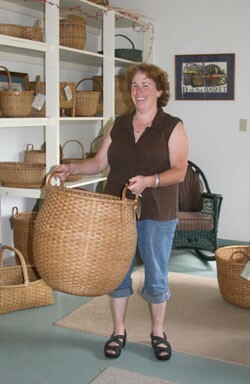 Nonetheless, the unassuming, ruddy-cheeked Andrews makes basket weaving look easy as she demonstrates in her Salisbury kitchen, the center of operations for Naturally Inspired Baskets. Here, she soaks coils of rattan, a vine that grows in Southeast Asia, in her sink and weaves standing at the kitchen island. She snips off only a few strips for now, explaining that the minimum to hold a beginning weave is three across and three down. A “binder” strip woven around this starter-basket’s nine central squares holds the base in place; she bends the other strips up around it to form walls. Working from this basic model, Andrews can turn out everything from pack, egg and berry baskets to her massive “urn,” which is nearly half her own height. From the kitchen, it’s a short walk past the stuffed iguana in the living room — Andrews’ husband Jim is a herpetologist, previously at Middlebury College — and through the sliding glass doors to the studio. The small, separate building is an inviting showroom with a worktable and drying rack in one corner, where Andrews stains each piece after torching off its “hairs.” The oil-based stain lends them a warm look and some protection, she explains. Andrews’ inspiration for both color and shapes comes from antique baskets. “I like the old styles, particularly New England — as opposed to Shaker or Maine,” she explains. Some of her creations incorporate antique finds, including an oak barrel hoop she wove into an Appalachian egg basket, and an old butterfly net with a long wooden handle that she turned into something resembling a church collection basket. When items require wooden bases, such as her woven-lid pi cnic basket, Andrews’ source is more easily located: Ed Allen, the furniture maker who lives down the road, fashions them on demand. The studio’s back door opens on five well-manicured acres, maintained by Andrews. Her daughter Birch (a twin, with Ashley) hired her in 2003 to work in her landscape gardening and design company, based in Orwell. Now mother and daughter work as a pair, Andrews says, leaving basket weaving for rainy days and winter. Vermont natives, the couple moved to their Salisbury home six years ago from Andrews’ hometown of Bridport, 20 miles to the east; Jim was born in Middlebury, eight miles north. “We’ve traveled a lot, though,” Andrews assures with a smile. She taught herself basket weaving after taking a one-day class at Frog Hollow, Andrews says. The University of Vermont textile-design major began as a loom weaver and switched to weaving rattan after her girls were born. “I liked making the shapes,” she says simply. Some shapes she learned by studying pictures; others she thought up on her own, writing tips in a small notebook if they worked out. Call ahead to browse Kristine Myrick Andrews' showroom or schedule a basket-weaving class: 352-4734. She will attend the Norwich Sunday Craft Fair on August 31 and is one of two featured artisans at The Collective: The Art of Craft, a gallery at 47 Central Street in Woodstock, through September 30. View and purchase a dozen varieties of her baskets at www.naturallyinspiredbaskets.com.